No, they weren’t watching the stock market or the news. British Prime Minister David Cameron, President Barack Obama, Chancellor Angela Merkel of Germany, President of the European Comission Jose Manuel Barroso and other leaders take a brief break from the G8 Summit at Camp David, Md., to watch the overtime shootout of the Chelsea vs. Bayern Munich Champions League in the Laurel Cabin conference room this Saturday. White House photographer Pete Souza caught the priceless faces. 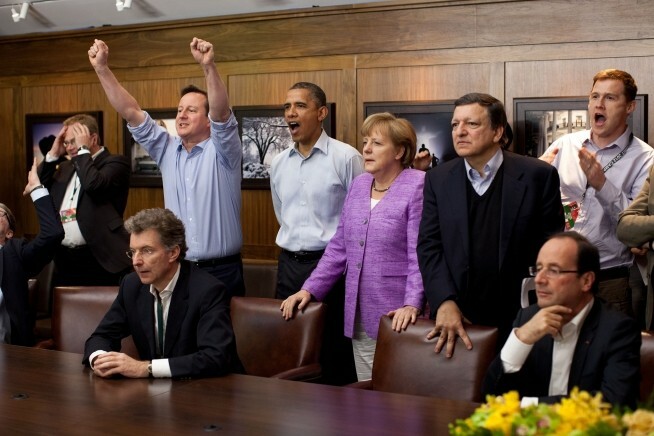 Cameron and Merkel clearly weren’t cheering for the same team — Chelsea, a UK team, beat its German rivals. The two world leaders, however, hug it out. This entry was posted in LifeStyle, Sports and tagged Beyern Munchen, Chelsea, UCL 2011-2012. Bookmark the permalink.